To send a log file to ValuePRO display the maintenance menu. This can be done be either pressing the maintenance button underneath the list of jobs or from the shortcuts menu. The log file contains information that will help the support team diagnose and problems the user in encountering. 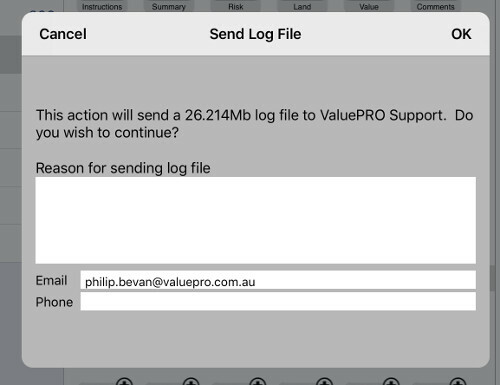 Tapping on Send Log File this will bring up the dialog box below. Please enter a reason for sending the log file, the Phone number field is optional but may help if support staff need to contact the user. Tapping on OK will send the log file. To Send the latest copy of your database files to support, take the Top Item from the Maintenance Menu. This will send a copy of your current database to support for analysis. Tapping on OK will connect to ValuePRO tour current data will be sent to ValuePRO support.